Physiotherapy treatment can greatly improve hip range of movement, decrease pain and improve muscle strength around a hip joint affected by capsular restrictions and limited range of movement. Physiotherapy treatment can also significantly improve function and decrease hip pain associated with osteo-arthritic changes confirmed by X-ray. 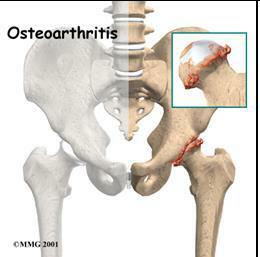 Early stage OA of the hip can present as sudden onset acute hip pain, as the condition of the hip joint (usually initially just capsular tightening with no X-ray changes) can deteriorate slowly without associated signs or symptoms. The first three hip movements usually restricted by capsular tightening are medial rotation, abduction and extension of the hip joint. Hip joint extension range is essential for walking, so if there is a gradual loss of this range, the patient may experience onset of low back pain for some time before the hip joint itself becomes painful due to the increased shear forces on the L5S1 segment. It is essential therefore to assess the hip joint range of movement in patients with recurrent or chronic non-specific low back pain, and even in patients who have a specific lumbar lesion, but who continue to suffer recurrences, in case the hip is contributing to the problem. Treatment for OA of the hip includes mobilizations of the hip joint (capsular stretches into the ranges that have been decreased, medial rotation in extension, for example), exercises for strengthening the glut max and medius muscles, exercises for lengthening and strengthening the iliopsoas muscle, hydrotherapy (strength, stretching, mobility and fitness), and land based stretches for any specific tight muscles in the lower limbs. The earlier the restricted hip is treated, the more likely the function of the hip can be restored and the pain diminished and the patient commenced on a home exercise program to maintain and even further improve strength, mobility and function.